Have you ever been asked to do something you weren’t sure you were capable of? Or been in a situation where you felt completely over your head? Have you ever felt unqualified? Unworthy? Unlovable? Unbeautiful? I know I have. In fact, when I was asked to speak to the youth at our summer camp – I was excited! At first, that is. Then that small little voice of fear crept in. You see, Satan doesn’t take a sick day. He doesn’t sit back and think, nah I’m just going to let that one slide. No, he’s always there, waiting for the opportune moment to sink his claws in and destroy anything good God has for us! He attacks us based on what he KNOWS we are capable of because he knows what Christ, who lives in us, is capable of! So when that little voice started saying to me: you aren’t ready for this. You’ve never stood in front of people talking (as I started having horrible flashbacks to college speech classes) – You aren’t qualified to do this. I quickly felt deflated and defeated. Sure I’ve done the small group thing before – where you have the instant feedback and gratification from your participants – but to actually get up and speak to an audience – to preach – mark that one on my ‘Never Have I Ever’ list. Satan takes the truth and twists it until it becomes a lie you believe. As a prime example, just last night – through a series of crazy events – we saw bugs on the beds we were preparing to sleep in. The truth of the matter – it was an actual bug on the bed. The lie – they weren’t bedbugs. Satan took that truth, and through fear, twisted it into a lie until we were so overcome by it that no one wanted to sleep on the beds. Satan comes to STEAL the TRUTH from you, to KILL your FAITH and FUTURE, and DESTROY EVERY GOOD THING GOD HAS FOR YOU. So the Lord really began to minister to me about who I am and who lives IN me. He LIVES in ME! He LIVES in YOU! 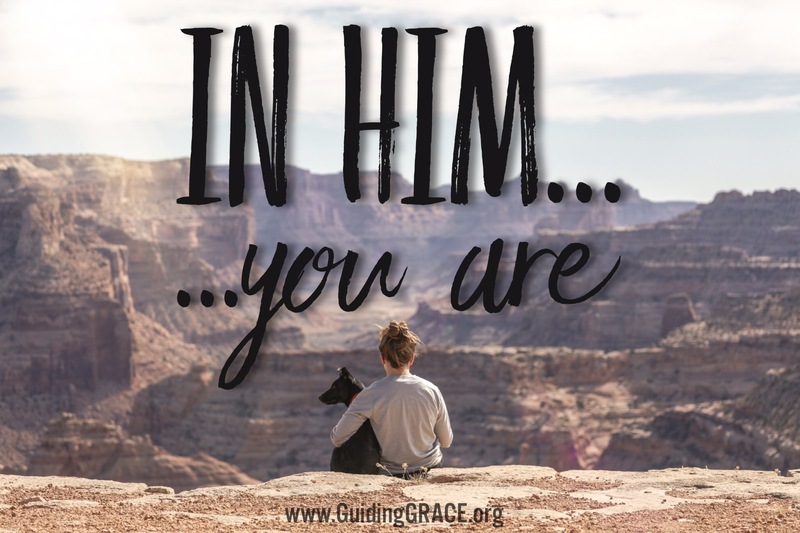 Because of Him, because He lives in me…when I believe the lies of the devil and I say I’M not qualified, I’M not capable, I’M not beautiful, I’M not ENOUGH…we are saying that Christ IN US isn’t qualified, isn’t capable, isn’t exactly who He created you to be – we are saying Christ ISN’T ENOUGH! I don’t know about y’all. But that revelation hit me like a ton of bricks. Christ IS enough. His death and resurrection ARE my LIFE! When the greater one resides in you…who can be against you? What dare be against you? But even more so as I was praying over this Wednesday on my drive to church…the Lord began to minister to me about not just Christ in me, but Christ in others. One of the nasty lies of Satan I’ve believed all of my life is that I wasn’t pretty, wasn’t beautiful. How much more so if I didn’t believe it and didn’t love myself, then how could anyone else find me pretty, or beautiful, or love me?! That’s when the Lord began to minister to me that if He’s in me and He is everything, then isn’t He the same in other believers too? I have to believe that Him in me, Him in you, and Him in my future spouse are enough too! With Christ in you, because of the sacrifice He made…you are equipped and capable and beautiful and EVERYTHING HE DESIGNED YOU TO BE!! When I wrote Cannonball Faith 517 days ago, I had no idea this is where it would take me or how many people my words, God’s words, would reach. I told God from the beginning, if I did it for just one person to know how valued they are, how precious they are, how beautiful they are, how loved they are, then I would know it was all worth it. The Lord has shown me bits and pieces here and there, but it wasn’t until a year ago, when I filled out a card at my church for what I would like to volunteer/do, that I really started to see the big picture. At that time, all I knew was that my heart was to work with the teen girls – to help them see that their invaluable worth in God is greater than they could ever know – to help them see what I couldn’t see myself as a young teenager. But when I was pressed for what that actually meant, I wasn’t sure. So I sought God for His direction with my heart’s new found desire. It took longer than I expected – God seemed rather silent on the matter for more than a couple of months. But one night, I gave it all over to Him and found rest in His peace. And in that moment of surrender, I heard the word “Grace” – and just like that GRACE – Girls Rising Above Common Expectations was planted in my heart. Romans 12:1-2 says to not only live a holy and sacred life, but to allow God to transform you instead of conforming to who the world thinks you should be. It is the foundational scripture for GRACE – don’t become who the world thinks you should be, become who God already knows you are. The world has so many pressures and expectations it places on our girls (and boys too): look this way, weigh this much, wear this brand, date this person, do this thing, etc., etc., etc. I wrote out my vision, made it plain, and hid it away – sharing only with a few trusted people. One person I shared it with, whom I admire and trust very much, immediately said “You sound like Lisa Bevere”. That is perhaps the most flattering compliment I’ve ever received in my life! Over the next 9 months (yes I see the irony in that), GRACE grew bigger and bigger inside of me even when things in the natural weren’t going the way I expected them to with it. In fact, in the natural, I was downright discouraged. This perfectly summarized how I had felt over the past 9 months but also poignantly put what I had done. When GRACE didn’t happen the way I thought it was going to, I went back to God and said, “I know this is Yours, not mine. So show me what I need to do. Show me what You want for GRACE.” And with that, Guiding GRACE was born.. The vision for Guiding GRACE grows bigger within me every day. The things God has shown me, and continues to show me, keep me astounded at God’s goodness in my life! I am so excited for everything that is still to come for Guiding GRACE, but for now, these small steps (that seem so huge), are the first steps towards all that God has for this big vision in this heart of mine. GertieOnline is now GuidingGRACE!! The blog has already reached thousands of people and 36 countries around the world – and it’s just beginning!! God is so good!! Every person that has left a comment, message, email, text, social media share, followed, and even your comments in person – every one of those has meant the world to me and helped me see that yes, THIS, was worth it all! Don’t ever be discouraged because people aren’t using you the way you think they should. Be confident in what God has placed in your heart and press into Him even more – His visions and callings aren’t reliant on other people to make them happen, they’re only reliant on you and your obedience to Him. It’s amazing how at the age of 33, I still allow the voices from my childhood to influence my life today. When you think back over your past, your history, there are always moments in time that stand out to you – good and bad. You’re history made you who you are today, but it doesn’t have to dictate your future. Silencing the voices of inadequacy in your head are possible, but you have to give in to God first, knowing He made you perfect, just the way you are. I can remember the day as if it was yesterday. An awkward, and completely average (not overweight) little girl was standing in her friend’s bedroom playing dress up, only to be scolded by the friend’s mother. “Don’t wear that! Take it off now!” You’ll stretch it out!” At 8 years of age, I found myself holding back tears while I was told I wasn’t ‘skinny’ enough to play dress up. I saw myself as ‘different’ and ‘fat’ from that day on. Fast forward to age 16. Try outs for the youth group band. All my life I had been told I had a gift for singing. My grandmother even called it an anointing. “Your vocal range is amazing! But we just like her better since you haven’t been trained on harmonies.” The consolation from the pianist didn’t help – “You’re a much better singer than her, but it’s a popularity thing; I’m sorry.” From that day on I didn’t see my voice as a gift from God, or anointed; I saw it as “not good enough”. I’m 19 years old, standing in the parking lot of “B’s” apartment complex, getting ready for him to move to California. He kisses me tenderly and then holds my face in his hands and says to me: “You’re so pretty – but you’d be beautiful if you just lost these round cherub cheeks.” After that moment, I no longer saw myself as pretty or perfect. I looked in the mirror and only saw my flaws – my round cheeks, scars, crooked ears, etc. I saw myself as not pretty enough, not beautiful enough, not perfect enough. For far too many years, I’ve let those voices from my past take up residence in my present – at many times even tainting my future. These voices in my head, moments in time, words that were said – I allowed them to shape me into who I am today: the girl who battles with her weight, who is self-conscious to sing where others can hear her, who feels unbeautiful, and who feels completely inadequate most of the time to complete what God has put in her heart for G.R.A.C.E. But something clicked this week. Maybe it was when I realized how stupid it was to worry about my voice. Or perhaps it was when I was reminded, as long as I am in the will of God, then I am the right girl, in the right place, at the right time, doing exactly what I am supposed to be doing. But the real freedom from these voices came when I sought God for His answer to the voices from my past. Anytime we accept the idea that we are not enough, we negate all that Christ laid down for us to be whole, perfect, and blameless in the eyes of God. We aren’t just saying “I’m not enough”, we are saying “Jesus, you aren’t enough”. That revelation right there silenced the voices of my past. I never want to diminish or devalue all that God has done for me because He loves me and made me perfect just the way I am. You made all the delicate, inner parts of my body and knit me together in my mother’s womb. Thank you for making me so wonderfully complex! Your workmanship is marvelous – how well I know it. You watched me as I was being formed in utter seclusion, as I was woven together in the dark of the womb. You saw me before I was born. Every day of my life was recorded in your book. Every moment laid out before a single day had passed. Words can hurt, and because we are human, they won’t easily be forgotten – but with the help of God, and knowing you are perfect in Him, you can silence those doubts when they try to take up residence in your thoughts and actions. 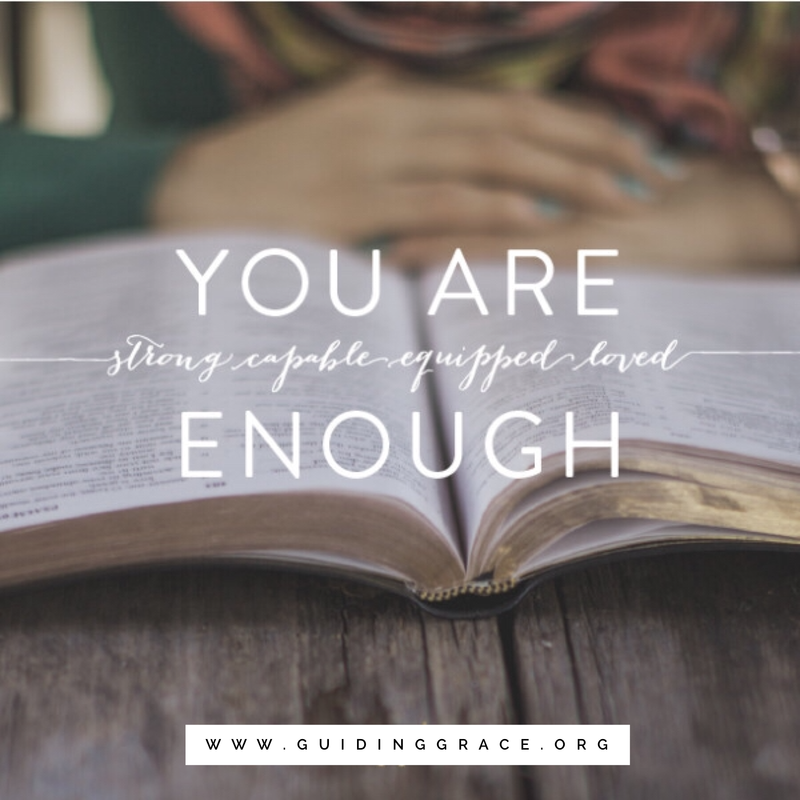 So when those voices rise up in your head to say: you aren’t pretty enough, skinny enough, smart enough, or whatever inadequacy you’re facing – remember YOU are enough because God on the inside of you is all you will ever need to be complete and perfect in Him! He doesn’t create subpar works of art – He creates priceless masterpieces. They had love goggles on! What are they, you ask? I’d like to think they are a better (and Christian approved) version of beer goggles…you know, the eyes a drunk person sees someone through after one too many drinks, when they think everyone is just amazing. Now take that, but minus the feeling/need to distort reality, via alcohol – and you’ve got love goggles my dear readers. But how does this pertain to love? Do we have to be drunk to fall in love with, dare I say, the unlovable? No, of course not! 1. I’m a firm believer that there is someone for everyone. 2. Love isn’t blind – it’s just got “love goggles” on. On one of those fun outings to Walmart, I saw a very unconventional couple. A tall, skinny, well dressed, and good looking guy with a wife who weighed easily 350lbs, tattoos galore, clothes that were wrinkled and stained, and hair that was more unkempt than a rat’s nest. Does that paint a picture for you of how odd a couple this was to see? Me: Ok, if SHE can find someone, then what the heck is wrong with me? I guess love really is blind if HE can love someone like THAT. 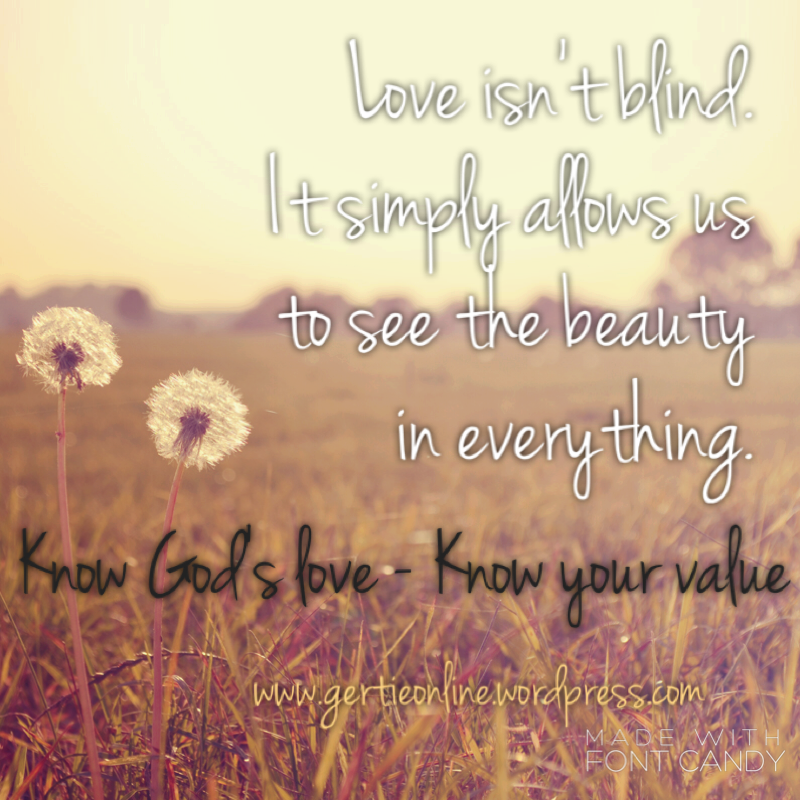 God: Love isn’t blind. It simply allows you to see the beauty in everything. When you see people through MY love, you’ll see them the way I do – you’ll see the unique beauty that each person holds because I created them! I’m going to let that sink in for a minute. It took me a few minutes to fully grasp what I had just heard, what I had just received a rhema on. “Love isn’t blind. It simply allows us to see the beauty (God’s beauty) in everything!” This might be one of the most profound things I’ve ever heard from God. Definitely in my top five. The inmate in prison. The soldier that returns from war without his limbs. The woman who was disfigured in an accident. The sinner on the sidewalk. Get off of your high horse! Not one of us is more righteous than the other. We are all sinners saved by grace and transformed by His love. The easiest thing to do in life is judge a book by its cover – or a person by their outward appearance. But when we do that, not only are we not showing God’s love, but we aren’t seeing with His love either. God created each of us in His image. We might, along the path of our life and free will, make decisions that may alter our appearances in negative ways (I type this as I’m munching on salt & vinegar chips, even though I’m supposed to be low-carbing it right now). But no matter the changes our body and outter appearance go through, God will always see us as He created us – He’ll always see our heart and our true beauty. I challenge you all, this week, to put this to work in your own lives. Stop seeing only the outward appearance. Stop looking at the circumstances – past and present. Stop seeing people with your worldly eyes. See people through God’s eyes this week. See them through His eyes of love. I’m not talking about passionate Eros love; I’m talking about compassionate Philia and Agape love. Determine now to see the beauty in all of God’s creations. I promise, if you set in your heart and mind to do this, not only will your view of people change and your heart expand, but it will rock your world in a way only God can! The last few weeks have been rough for me. These last 5lbs before hitting my first goal have been very stubborn at coming off. Of course the holiday eating and get-togethers with friends and church members hasn’t helped either. But all of this has really had me thinking about my own self esteem and self worth. Last week I was talking on the phone with my bestie. She’s been so encouraging with the progress I’ve made so far, but I told her a little attention from guys wouldn’t hurt every now and then. I really need to be more careful with the words I use though. “T” came out of the woodwork last week after I mentioned the wiper blades on my car being bad on Facebook. Even offering to come to my work and fix my car there. Ok God, I get it…I need to be more specific. Receiving a compliment or some attention can really go a long way when your self esteem is low. Feeling pretty is one thing. But knowing that someone else sees you that way can mean even more. And God has always been so good to me when it comes to these low points in life. A marriage proposal from a drive-thru attendant who thought I was the most beautiful woman ever was a nice pick-me-up. Or the sweet little Jewish soldier, who not only gave me a custom parking place on the sidewalk, but also “guarded” my car because “I was the most beautiful woman” he had ever seen was definitely a self esteem booster. Recently, I was talking to a friend about this and how it pertains to relationships. That’s when I realized I was looking for a relationship to fulfill something that God had already done. I was looking for a guy to give me self worth; to see value in me. God treasures us. We are His and His love for us is so great that He’d do anything for us, including giving His Son in death so that we could live. 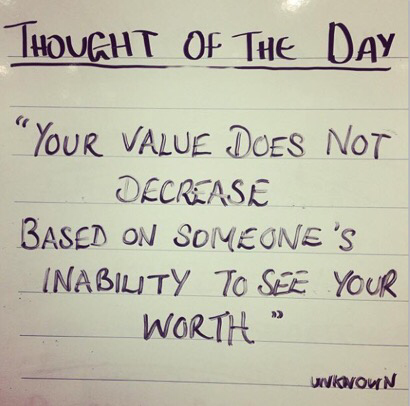 If that isn’t something to give you worth and value, I don’t know what is. But the Word doesn’t just stop there in John 3:16 about how much God loves us. God loves us so that He made us in His own image (Genesis 1:27). He didn’t make us in the image of some idea He had….He made us perfect in His own perfect image. He knows us and values us so much that He knows the numbers of hairs on our head (Matthew 10:29-31). He loves us so that He planned our futures before we were ever born (Jeremiah 1:5). People can give you value, but it’ll never be worth as much as the value God has given you because that value knows no limits. If you are looking to find your value in a man (or for the guys, finding value in a woman) you’ll find yourself disappointed because you’re looking for the world to fill a need that only God can really fulfill. Worldly value will fade with time and wane with a person’s feelings. 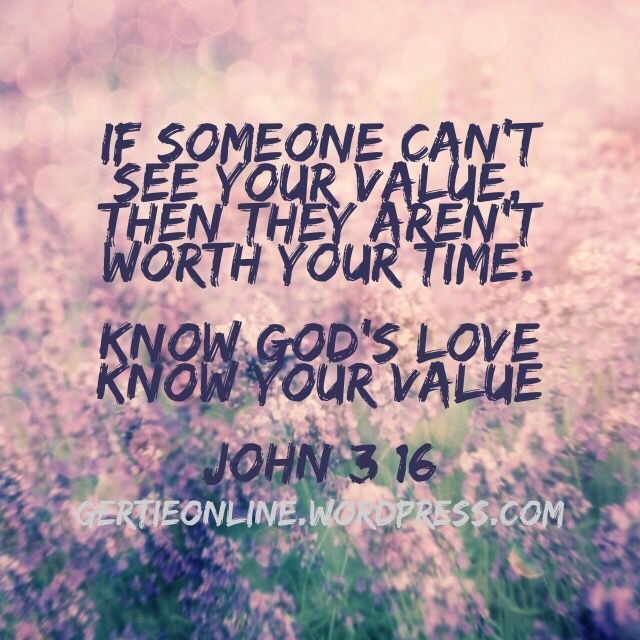 But your value in God will never change. So know that you are worthy, you are valued, but above all else, you are loved deeply and passionately in a way only your Creator can.